You may think there’s a debate to be had about who’s worse in the Bosasa scandal: big business, or our government. There isn’t. Just over a week ago, I found myself on a long phone call with Bosasa CEO Gavin Watson’s nephew Jared (or Jarrod, depending on who’s writing). He sounds like a very personable young guy, and likes to talk. 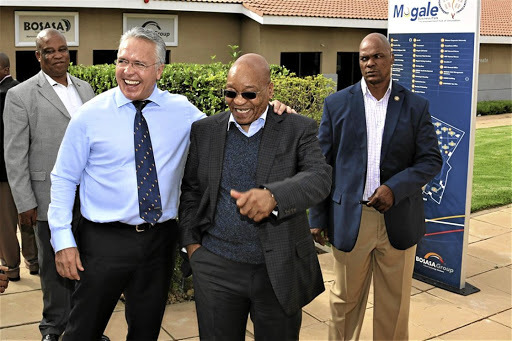 If you want to hear how he sounds, it’s his voice on the now infamous recording in which former Bosasa chief operating officer Angelo Agrizzi can be heard spluttering out k-word invectives like a big old fat cat trying to cough up his hairballs. Jared Watson’s main intention on our call was to cast aspersions on the motives of Agrizzi in coming clean. Agrizzi’s testimony last month was so intense, forthright and gripping, you might forgive people for now asking “Gupta who?” when it comes to the state capture commission. We’ve gone from the questionable memory recall of people like Vytjie Mentor discussing bathroom finishes at Saxonwold (and not being able to distinguish one Gupta brother from another) to the technicolour testimony of people bringing videos of bribery cash being counted out and near-irrefutable evidence of dodgy home upgrades for top officials. That Bosasa kept itself in such a heaven of tenders by greasing politicians is almost without question true. As far as Jared Watson and the people in his world is concerned, it matters that Angelo Agrizzi is lying about why he’s now coming clean. But it doesn’t. Not really. Even if there are some inaccuracies, exaggerations or red herrings in what Agrizzi told the Zondo commission, debating such finer points could simply turn into an argument over what the corruption had looked or smelt like exactly. It would still be corruption, and it would still stink up the room. It would still look like a dagger in the back of our hard-won democracy. Of course, it’s unlikely Agrizzi really did have that big Damascene moment he now claims he had, and that he’s now laying it all bare because he so loves our country. No doubt the big Italian wants revenge on the Watsons for his own reasons, and whatever else besides. I don’t care. It’s the rare frankness of what he said, for whatever reason, that should be considered most enduringly valuable. The issues his revelations force us to confront are deep, with one of the key question being: who do we blame more between government and big business, and who should we be expecting better and more from in future? Do we blame Bosasa (and the many companies like it) and all those who work there, or should we focus our anger instead on our government and those who work for it? This may present, for some, as a chicken-and-egg debate that could go on forever as we try to get to the bottom of who is “worse” in the great game of corruption: the corruptor or the corrupted? But it’s not much of a debate, because the answer is obvious. It will always be our government officials who must carry the worst of the scorn, and by a factor of a thousand. Why? Because no one in this country ever voted for Gavin Watson, or put him in charge of our affairs. Gavin Watson and Angelo Agrizzi never once went around to a stadium making big promises of creating a better life for all. It was our politicians who did that. It was they who declared they were dedicating themselves to lives of public service and who took oaths to uphold our constitution and the ethics of high office. The only thing a businessman like Watson has to dedicate himself to is his own financial gain – and if that involves playing the corruption game with more raw shameless audacity and Louis Vuitton handbags stuffed like turkeys full of Christmas cash, then that’s what he’s going to do. There have been numerous, and very understandable, calls for South Africa to “come down harder” on corporate crime. That’s fair. I hope it happens, and always have. But it would still have to be our institutions – which are in place through government – that would have to do all the cleaning up – and you can’t clean your carpet while the shoes you’re wearing are filthy. So we invariably always return to the culpability of the state and its actors, and how we badly need them to be cleaner and harder to corrupt. I would argue that the ANC has corrupted businesses and taught them the “rules of the game” far more than the other way around. But that, maybe, is just me. Our politicians have repeatedly betrayed us quickly and easily, for cash, groceries and electric fences, and there was never any accountability or consequence from the top. It started at the top, and you would have had more luck getting a chicken to play a tune on a keyboard than have Jacob Zuma come down on corruption. All that Gavin Watson seems to have really proved to us is that if you want to make it big in this country, you need to know how to stack your block of R100 notes into a million-rand cube like a game of 3D corruption Tetris. Should he and all who sailed with him go to prison? Of course. But if he isn’t there with the great betrayers themselves, there will simply be more Gavin Watsons in our future, just as there are probably thousands of them among us right now, flocking like remora cleaner fish around the hungry sharks we keep voting for in election after election.